Apparently the Iranian Major General Qasem Soleimani of the Islamic Revolutionary Guard in Syria attacked Israel on direct orders from Tehran without looping in President Assad. But he is said to have used Syrian assets. Israel's counterpunch was massive! This is how you deal with bullies. Reporting from #GolanHeights in #Israel near the Syrian border, the exact location where Iranian-Syrian forces fired 22 missiles into Israeli outposts last night. (1) The Saudis and Israel secretly made peace in 2006. In the video President Trump explains what is going wrong if you labor from faulty premises. The goal of the Obama nuclear negotiations was 'a deal', whatever deal at whatever the cost, from the premise that Iran is a benevolent regime with a right to nuclear energy. What could go wrong, right? Update: Rush Limbaugh just commented that the Iran deal is basically a set of political manifests that never passed Congress. The socalled "deal" is nothing more than a personal letter of intent by President Obama. 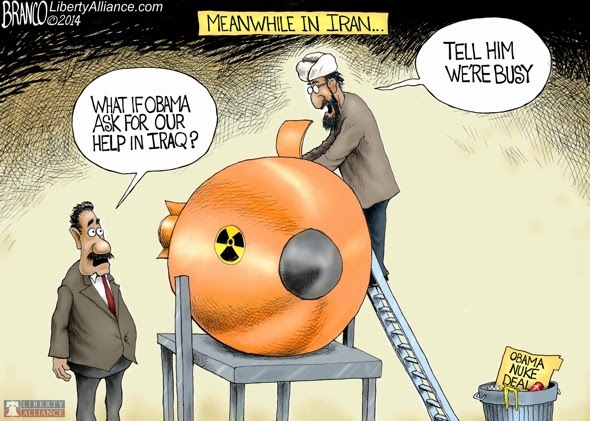 Iran never even signed it, so technically there is nothing to comply to. Here a reminder how "Ben Rhodes Reveals How Obama Duped America Into The Dangerous Iran Deal". Check also OBAMA SPARED HEZBOLLAH FOR IRAN DEAL on the historical archive on Dec. 18, 2017. The EU partners are still laboring under these fallacies. Any deal is better than none, they believe. EU Foreign Minister Mogherini puts het trust in the IAEA inspections, but military installations are exempted, as are missiles! Iran is living up to the spirit of the deal, but the premises of the deal is wrong! Mogherini -- an Italian communist -- worries that new sanctions will collapse the Iranian regime. Eh yes, that is the basic idea. Given that President Trump has given the EU partners a year to fix the holes in the deal, one would have thought the EU partners had given the matter some thought. But Chairman Tusk has only tabled the matter for discussion during a summit in Sophia on May 17! For now the EU is adhering to the deal which is "essential to the security of our citizens", according to Mogherini. Nothing could be further from the truth. OPEC has already received instructions from Saudi Arabia to crank up output to make up for the loss in Iranian oil. The new sanctions will come into effect over 180 days for oil and gas, and over 90 days for other products. Interestingly in their protests globalist liberals are giving away their moral deficiency: they are crying that Iran will start a war; so even they admit that Iran is unstable. Why would anyone think that giving an unstable country billions of dollars is a good idea? This shows you one thing: globalist liberals are laboring from a position of moral cowardice which they dress up as superior morality! Or as duty towards their citizens! But in effect they are sacrificing their own people and their national interests to this racket. #Live: President @HassanRouhani says United States has never complied with its commitments to the #IranDeal while Iran has complied with its commitment. The Iran Deal was always the apex of public policy Gaslighting. An historic day for Israel and the Jewish people. A deadly threat has been lifted. I am deeply grateful to Pres. Trump and his team for their clarity and courage in nixing the dangerous Iran nuclear deal. The Middle East and the world will be safer and better able to stop Iran. May 8, 2018: President Trump Iran nuclear deal decision. (1) Before I go to bed, let me tag in @Debradelai @drawandstrike and @GenFlynn to talk about ANOTHER gift that Obama gave the Iranians. This isn’t the first time John Kerry Broke the law. In 1970 he met illegally with North Vietnamese communist. U.S code 18. U.S.C. 953. (VIDEO) NETANYAHU PRESENTION: "IRAN LIED"
April 30, 2018 Prime Minister Benjamin Netanyahu issues Statement on Significant Development Regarding the Nuclear Agreement with Iran. After the US and the EU caved to Iran and Obama sent billions in cash on pallets in the dead of night to Tehran, Israeli Prime Minister Benjamin Netanyahu says Iran "lied" after signing nuclear deal and moved weapons to a secret location and that Israel has "new and conclusive proof" of that. Israeli Intelligence uncovered a huge amount of new and dramatic information on the Iranian nuclear program. President Trump is set to make a decision before April 15 to continue or to abandon the Obama era Iran Deal.
.@netanyahu has the goods on the mullahs. Half a ton of evidence from the continuing Project AMAD program building nuclear weapons to use against the West. Yesterday Scott Adams recorded an interesting discussion with Breitbart's editor at large Joel Pollack about the prospects of the nuclear deal with Iran. Ballistic missile was supplied by Iran and fired by the Houthi rebels in Yemen targeting the Saudi Arabia capital. @nikkihaley further explains that Iran is a threat to peace and security to the entire world. Col. Oliver North said on Hannity yesterday that there is cooperation between Israel and the Saudis with Sunni adversaries of the Shiite regime in Tehran. 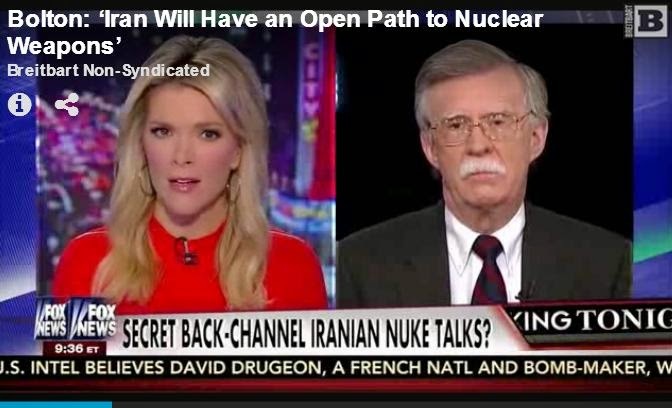 He said the US and allies don't have to take out the nuclear sites in Iran because the Arab allies are already on it. There are also rumors of regime change plots in Tehran. Today President Trump weighed in on the notice delivered to Iran yesterday by Gen. Michael Flynn. Majid Rafizadeh at Gatestone has the specifics: Iran is in breach of UN Security Council Resolution 2231 (section 3 of Annex B) and resolution 1929. Russia, a Tehran ally, is siding with Iranian leaders arguing that Tehran has not violated the UN resolutions because Tehran's ballistic missile is not "capable of delivering nuclear weapons". Moscow is playing with words. Iran calls US national security adviser Flynn's remarks " repetitive, baseless and provocative". (Read more). FLYNN PUTS IRAN "ON NOTICE"
Feb 1, 2017 National Security Adviser Michael Flynn says the US has put Iran "on notice". National Security Advisor Michael Flynn says the US has put Iran "on notice" over a provocative Iranian ballistic missile firing. He says it is in defiance of A UN Security resolution. He says Trump has criticized the agreement President Barack Obama made with Iran is "weak and ineffective" and now Iran is feeling "emboldened." "As of today we are officially putting Iran on notice." White House Press Secretary Sean Spicer was later asked what "putting on notice" meant and he refused to elaborate. Before he was elected President Hassan Rowhani brags about deceiving the West over the illicit nuclear program and claimed credit for vastly expanding it. H/t Nasim Online, translation: Reza Kahlili. Logged on Sep. 21, 2013. Updates on $11,9 billion to Iran on the dedicated live blog. Republican condemnation of a top White House aide who boasted about the administration’s success selling the Iran deal to the public reached new levels on Tuesday, as several senators urged President Obama to fire him and a House committee looking into his claims went forward with its hearing – even though he didn’t show up to testify. The House Oversight Committee hearing was called to examine White House “narratives” on the Iran deal, after top adviser Ben Rhodes was featured in a New York Times Magazine profile claiming they built an “echo chamber” to sell the plan. Chairman Jason Chaffetz, R-Utah, had called Rhodes to testify, but the White House shielded him from the appearance. Commentary from Israel on the recent revelations in a controversial New York Times story concerning the White House’s marketing of the Iran nuclear deal. Breitbart Jerusalem bureau chief and senior investigative reporter Aaron Klein in a radio interview on Wednesday speaking during his weekly segment on John Batchelor’s popular national radio show. Click below to listen to Klein’s full segment on Batchelor’s program. There are a number of fallacies in Obama's logic, but leaving aside the secondary considerations, the essence can be summarized in this formula: The Left is creating a false dichotomy based on fear: capitulation, or death, war and gas chambers, while their appeasement leads to exactly that. Demoralization has led to the inability to distinguish friend from foe. The enemies are not the insane Iranian mullahs, but the Republican party! The dichotomy isn't capitulation or war as the Left has it. It's defend or die. This is Chamberlain at Munchen all over again. Negotiating with the enemy over peace terms rather than dictating them, implies moral equivalence. The negotiators of the P5+1 certainly believe that. That's the basis of diplomacy since the event of the Westphalian order in 1648. Which is why Iran continues its hostilities. This is no victory, but surrender without a fight. Iran continues its hostilities, not in spite of, but because of the deal. The fall out of the deal between Iran and the 5 powers+1 is still developing, but the outlines of this disaster are getting clearer by the day. If you believe that Obama is a puppet with a mission, the Iran deal may well represent his magnum opus. Obama (and Jarrett behind the throne) made sure Iran got a deal it couldn't refuse. As Caroline Glick pointed out in her speech, the ayatollahs got a signature bonus of $150bn, and that's just for starters. But there is dissent in the ranks of the Iranian Revolutionary Guard too. Former Congressman and US army veteran Allen West making a passionate and emotional speech to over 12,000 people in Times Square at the 'Stop Iran Deal Rally'.
.@IsraeliPM: "#Iranians aren't even trying to hide that they will use the hundreds of billions" in #IranDeal to arm their terror machine. Postmodern leaders in the West want "peace" with Iran at any price, also nuclear proliferation in the Middle East and the sell out of our allies. Iranian Defector: "US Negotiating On Behalf Of Iran"
An Iranian journalist writing about the nuclear negotiations between the United States and Iran has defected. In an interview Amir Hossein Motaghi (...) has a damning indictment of America's role in the nuclear negotiations. Pathetic! Kerry is using the 'logic' of permissive, progressive parents: "They are going to do it anyway, so why not let them do it legally?" Kerry says that under the Bush administration's "zero enrichment" policy, Iran built and installed 19,000 centrifuges. Israel's foremost challenge, Netanyahu says, is Iran's attempts to strengthen its foothold on Israel's borders, even as it tries to arm itself with nuclear weapons. Feb 22, 2015 Prime Minister Benjamin Netanyahu's Remarks at Weekly Cabinet Meeting. Jan 22, 2015 Israeli media Channel 2 released satellite image of new Iranian long-range 27 meter missile on a launch pad outside Tehran, that can reach far beyond Europe. Apparently the Iranians simply published Obama's private letters in the state press. US and Iran sharing a 'space' in Iraq requires coordination. There's not just the danger of accidents and collateral damage, but Iran drawing its own plans might work against the coalition's. What's In Obama's Private Correspondence With The Ayatollah? Obama has been sending letters to the Iranian Supreme Leader Ayatollah Ali Khamenei last month offering to work together against the Islamic State in exchange for a deal on Tehran’s nuclear program. Israel or other Middle Eastern allies were not informed. In the missive, Obama describes a shared interest in working against the Islamic State group. The White House has refused to confirm or deny, saying the matter was "private". In the fourth letter Obama states that the US operations in Syria aren't targeted at Assad. (Source) Just last week US and Arab officials revealed to WSJ that Obama has moved closer to Iran and it’s terror proxies Hamas and Hezbollah. They noted on secret channels of communications to Iran via senior Shi’ite sources in Iraq. Perhaps the hand of Obama's Rasputin, Valerie Jarrett? Here an atmospheric picture of the mood in Tehran. (Source) The regime is still spewing that odd mix of Shi'a Islam and Marxist dualism. According to unnamed sources in Washington, Iran ordered its Lebanese proxy Hezbollah to carry out Tuesday's attack on Israeli forces patrolling the Israel-Lebanon border following an alleged attack on the Parchin nuclear facility in Iran "by a foreign state," the Kuwaiti newspaper al-Rai reported on Friday. Hezbollah planted and detonated two bombs in the Har Dov region along the Lebanese-Israeli border on Tuesday, with one device injuring two IDF soldiers. A second blast tore through the same area about 30 minutes later, but failed to cause injuries or damages. Satellite images taken of Iran’s Parchin military compound after a blast reportedly tore through it show “damage consistent with an attack” at the site, according to an earlier report by the Israel Defense website on Thursday. According to the report by Ronen Solomon, the images form evidence that “refutes the denials of the Iranian government” and prove that the explosion at Parchin – which has been linked by Western intelligence to nuclear missile fuse trials – “indeed occurred inside the military compound.” The images “clearly show damage consistent with an attack against bunkers in a central locality within the military research complex at the Parchin military compound,” the report added. (Source) Scroll down for more information. The Great Satan's power vacuum after Obama's 'change' hasn't been lost on the Mullahs. Like every other critter of the dark, they smell a chance. The day after another round of talks in Vienna began between the world powers and Iran in an attempt to reach a draft agreement on its nuclear program, Jerusalem is not sitting idly by and started a worldwide campaign against the Iranian regime. On Wednesday, in the Red Sea, Israeli commandos intercepted a freighter carrying a secret cargo of munitions loaded in Iran and hidden under bags of cement. The weaponry included dozens of Syrian-made M-302 rockets which Israeli authorities say were bound for terrorists in Gaza, and from there would have been capable of striking almost anywhere in Israel, including Tel Aviv and Jerusalem. "While @MarietjeSchaake (Dutch EP for the Liberal Party) is visiting Tehran, the mullahs are executing 38 people. 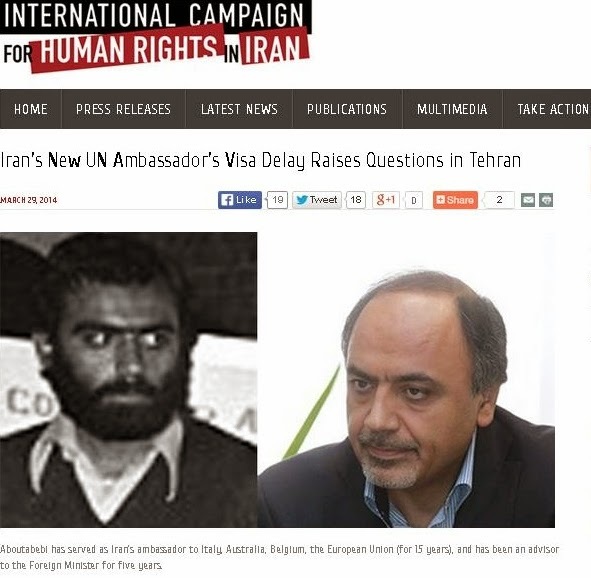 Dutch Parliament wants to join the party"
Also spike in executions in #Iran despite Reformist-backed administration in office for six months http://t.co/UnuLAO7Fhp. John Bolton in "Abject Surrender"
(...) This interim agreement is badly skewed from America’s perspective. Iran retains its full capacity to enrich uranium, thus abandoning a decade of Western insistence and Security Council resolutions that Iran stop all uranium-enrichment activities. Allowing Iran to continue enriching, and despite modest (indeed, utterly inadequate) measures to prevent it from increasing its enriched-uranium stockpiles and its overall nuclear infrastructure, lays the predicate for Iran fully enjoying its “right” to enrichment in any “final” agreement. Indeed, the interim agreement itself acknowledges that a “comprehensive solution” will “involve a mutually defined enrichment program.” This is not, as the Obama administration leaked before the deal became public, a “compromise” on Iran’s claimed “right” to enrichment. This is abject surrender by the United States. In exchange for superficial concessions, Iran achieved three critical breakthroughs. The 5+1 have reached a temporary deal with Iran for the duration of 6 months. Only the world's mental babies are glad. Everyone else is highly criticial, Israel has butchered the outcome as the start of a new arms race. Sanctions are not something that can be switched on and off like a switch. The uranium which is >20% enriched remains in Iran. It must be downgraded, but who will do that? The enrichment facilities will not be closed. Damaged centrifuges can still be replaced under the agreement. The demand that Iran stops enrichment has been dropped. The concessions are on the West, which is desperate for peace at any price: sanctions will be loosened while the West will not undertake any actions against Iran's proxies, Syria and Hezbollah. Iran gets away Scot free and will be able to breakout in a matter of weeks. A digest of the main reactions. This is the confidence trick pronounced by Lady Ashton: "a long term, comprehensive agreement of reciprocal measures to be undertaken by both sides" - as if there were moral equality! A compromise between food and poison, is poison. Conservative US: "Iran Deal: Not as Bad as It Could Be, but Still Bad"
Saudi Prince Alwaleed bin Talal : "OBAMA IN OVER HIS HEAD WITH IRAN"
United Against Nuclear Iran advocacy organization, which includes IAEA deputy director general Olli Heinonen, former Mossad director Meir Dagan and Fouad Ajami, professor and director of Middle East Studies at The Johns Hopkins University School for Advanced International Studies: "Nuclear breakout possible in two months, group warns"
"‘Historic mistake’: Netanyahu says world is 'more dangerous place' after Iran deal"
Bibi Netanyahu is really upset. These nihilists in Geneva are in the process of dismantling sanctions while Iran isn't required to dismantle as much as one centrifuge. The future of the world is in the hands of mental babies of razors! Bibi Netanyahu: "It's a bad deal; a very, very bad deal". Israel, alarmed at the prospect of a U.S.-Iranian rapprochement, is reported to be discussing the possibility of an anti-Iran alliance with longtime Arab adversaries like Saudi Arabia and the United Arab Emirates, a project that could have immense ramifications in the Middle East. (...) Senior Israelis have held meetings with prominent figures from a number of Persian Gulf and other Arab states in recent weeks in an attempt to muster a new alliance capable of blocking Iran's drive, Israel's Channel 2 television reported Wednesday. NETANYAHU: "WE WILL FACE IRAN ALONE IF NECESSARY"
Israel's prime minister declared Tuesday that his country will never allow Iran to get nuclear weapons, even if it has to act alone, and dismissed Iranian President Hassan Rouhani's "charm offensive" as a ruse to get relief from sanctions. Benjamin Netanyahu, speaking to world leaders at the U.N. General Assembly, played the spoiler to Iran's overtures to warm ties with the U.S. after decades of estrangement. Not everyone in Iran is agreeing with their President, the super 'moderate' peace maker! #Iran's top Revolutionary Guard commander: Exchange between #Rouhani and #Obama was a tactical mistake that can be corrected. There is no reason to suppose that Rouhani will ever commit to the termination of the nuclear program. SIn fact, the purpose of this farce is to buy time until Iran has completed the process of acquiring a nuke. (...) In 1938 the British PM Chamberlain made a concession to Hitler and ceded the entire territory of Czechoslavakia in exchange for peace. Winston Churchill was furious: ""You were given the choice between war and dishonor. You chose dishonor and you will have war." Churchill knew this to be the case, because Hitler's ideology and intentions were clear to his mind. The dishonor in 2011 wasn't in terrotorial concessions to Iran, but rather in the absence of action. Years ago the Iraeli defense minister Ehud Barak predicted that Israel would have to face Iran on its own. The West would be stupified. 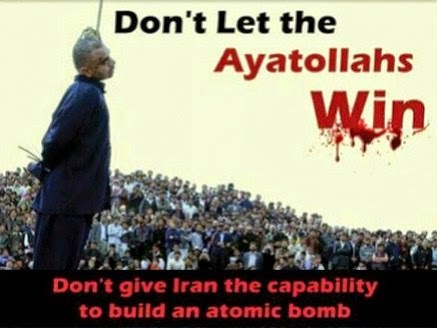 This is the West's dishonor: the inevitable war with Iran will be left up to 6 million Israelis. "Uranium", a timely and powerful documentary presenting the danger posed to the free world by a nuclear Iran. The film exposes the radical Islamic ideology guiding Iran's leaders, and the destruction it causes. A senior Iranian military leader said that his country’s “power and resistance” has forced the United States and President Barack Obama to kowtow to Tehran, according to reports in Iran’s state-run media. The senior military aide to Iranian Supreme Leader Ayatollah Khamenei said that Iran has strong-armed Obama into accepting its nuclear rights. “The Americans have sensibly chosen a type of flexibility and withdrawal vis a vis Iran,” Major General Yahya Rahim Safavi was quoted as saying on Wednesday by the Fars News Agency. The United States “reached this conclusion that they can’t challenge the powerful Iran,” Safavi was quoted as saying. Rowhani (in his second speech for the global potentates) said he's looking for Israeli nuclear disarmament, while Iran of course has no plans at all to suspend it's secret programs. The world's leaders will see him as a dove of peace, evidently. No one cares, I suppose, but Hollande really *lavishly* shook Rouhani's hand--like he totally loved it. All over French news. Following Russia's President Putin's column in The New York Times last week, the Washington Post has now signed up the new 'moderate' president of Iran, Hassan Rouhani for an op-ed. Rowhani's election motto was "Prudence and Hope"; his power does not reach beyond that of the Supreme leader, Ali Khamenei. The WaPo called Rowhani "perhaps the most moderate candidate in the country's six-way presidential race". The world's democratically elected leaders will be rubbing shoulders next week with global dictators and tyrants at the UN Headquarters. The French President François Hollande has announced to have accepted Rowhani's invitation for a tête à tête, the first meeting between the countries since 2005. The moderate Mullah will also have talks with the P5+1 (international community code for the five permanent members of the Security Council plus Germany). Also Obama's court eunuchs have signalled an 'extremely small' meeting with Barack Obama. With the US's experience with North Korea in mind, it is possible to assess US actions with regards to Syria and Iran. The Obama administration is clearly implementing the North Korean model in its dealings with Syria and Iran. With regards to Syria, there is no conceivable way to peacefully enforce the US-Russian agreement on the ground. Technically it is almost impossible to safely dispose of chemical weapons under the best of circumstances. Because Syria is in a civil war, the notion that it is possible for UN inspectors to destroy the chemical weapons is absurd. In case Assad is in non-compliance the agreement requires complaints to be discussed first at the UN Security Council where China and Russia wield veto power; it is clear that Russia is willing to do anything to protect the Syrian regime and no action will be taken. Like former US presidents with regard to Pyongyang, Obama has effectively accepted the continued legitimacy of Bashar Assad, despite the fact that the regime has been violating rights since decades. As was the case with Pyongyang and its nuclear brinkmanship and weapons tests, Assad won his legitimacy and removed the US threat to remove him from power by using weapons of mass destruction. As for Iran, Rowhani's talk of closing Fordo needs to be viewed against the precedents set at Yongbyon by the North Koreans. In other words, even if the installation is shuttered, there is every reason to believe that the shutdown will be temporary. Just as North Korea remains off the list of state sponsors of terrorism despite the fact that since its removal it carried out two more nuclear tests, it is hard to imagine that sanctions on Iran removed in exchange for an Iranian pledge to close Fordo, would be restored after Fordo is reopened. Like North Korea, Iran will negotiate until it is ready to vacate its signature on the NPT and test its first nuclear weapon. The danger posed by Obama's decision to seek a false compromise rather than accept an unwanted confrontation following Syria's use of chemical weapons will only be removed when the US recognizes the folly of seeking to wish away the dangers of weapons of mass destruction through negotiations. Those talks lead only to diminishing US power and danger, as more enemies develop and deploy weapons of mass destruction with the sure knowledge that the US would rather negotiate fecklessly than contend responsibly with the dangers they pose. Hitler showed a dictator will sign any treaty happy in the knowledge he will not adhere to it and that no one can make him.